You’ve finally done it. You plotted and tricked and seduced and betrayed your way onto the throne. The crown is yours, and so is the kingdom. You’ve amassed the largest army, overthrown the last loyalist, destroyed any remaining resistance force that dared come against you. All that’s left is sweep grandly into the throne room and claim what’s yours. Wait, you do have a cape, right? We mean, really, you can’t be a proper evil queen without one. It’s just not as dramatic, or intimidating, or… evil. Every evil queen has a cape. 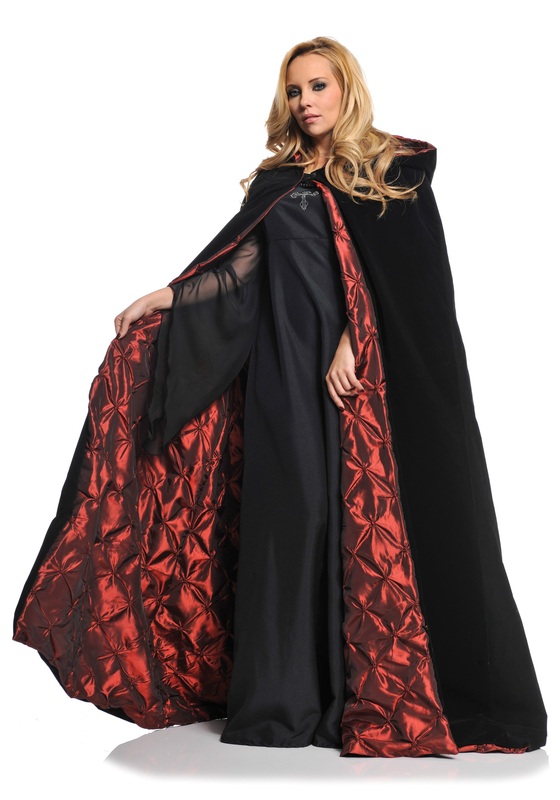 Luckily for you, there’s an easy fix to your problem: this Women’s Deluxe Velvet Cape with Quilted Red Lining. This cape is both regal and commanding, a cape that draws attention to your supreme fashion sense even as it reminds your subjects that you can behead them at any time. Made of 100 percent polyester velvet and taffeta, it features a black velvet shell and deep red quilted taffeta lining, with a button closure at the neck. Whether you’re receiving your rightful crown or charging into battle, this cape will add a rich, royal look that will command everyone's attention.